Modernizing the Korean Welfare State analyzes recent developments in social and public policy in South Korea. Its focus is the new approach to Korea's system of social protection, known as the productive welfare paradigm. This volume brings together an international group of scholars to examine the new paradigm and associated policy developments. In the first part, contributors examine the significance of the productive welfare paradigm and recent policy developments within a broader comparative and international perspective. They question the commitment to welfare in the paradigm, viewing it largely as an example of a global trend towards the "enabling state" in which social welfare serves largely economic goals. Other contributors situate the new paradigm in relation to globalization and its implications for national strategies of social protection developed in earlier times. The new departure in Korea is compared to European welfare state development, and contributors find it a bold attempt to fashion a comprehensive welfare state based on social rights. In the second part, contributors focus on specific issues and policy areas. These include the degree to which Korea has been following a "pro-poor" growth policy. They evaluate developments in the area of unemployment and work injury insurance. They review the progress of policies in the area of social insurance and assistance, and the American system of income support for low income earners and its lessons for Korean policymakers. Other contributors review the public pensions system in Korea, and environmental protection policies are discussed and the impact of those policies on the poor and people of color, who are disproportionately exposed to environmental hazards. 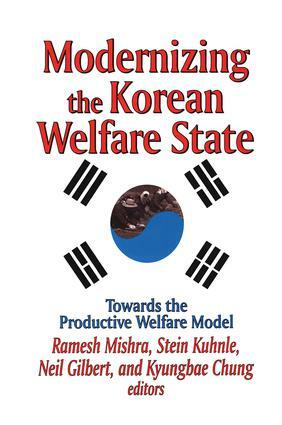 Productive Welfare in Korea: Moving Towards a European Welfare State Type?